In this video I develop a Rails blog app, while covering numerous topics. 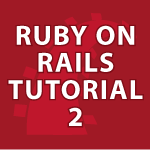 This tutorial was crafted to answer all the questions I have received since I made my original Rails video tutorial. Here I’ll cover the scaffold generator, building a MVC without scaffold, setting up the database, model, views, controller, partials, REST, CRUD, routes, before_action, validates, belongs_to, has_many, foreign keys, fixing errors, styling with SASS and more. 1. This time I'll use scaffold generators to develop a Rails app. a. A scaffold in Rails is a full set of model, database migration for that model, controller to manipulate it, views to view and manipulate the data, and a test suite for each of the above.